Note: If you have this breed, or know anyone who does, please send a good profile photograph of the Dog (without humans in the background). We shall publish it on this page with credits. You can send it either by e-mail or post. 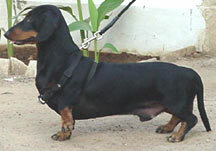 The Dachshund is one of the most recognisable of all breeds with its long body and short stature. It was used for hunting badgers and foxes. Show-Standard dogs have deep chests and short legs, while working dogs have less pronounced chest and longer legs. 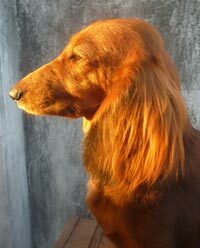 There are three varieties of Dachshund the smooth-haired being the oldest known, the long-haired Dachshund was probably developed by crossing the standard with short-legged spaniels. The wire-haired was created by crossing the smooth haired with rough-haired Pinschers, this produced a dog with a rough coat and a small head. Later the Dandie Dinmont Terrier was also probably used in the bloodline. the wire-haired is characterised by bushy wiry hair on the eyebrows and on the muzzle. 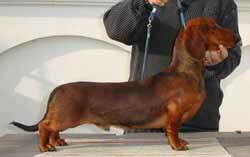 Dachshunds weigh 6.5-11.5 kgs and are about 25 cms tall. They come in a variety of colours like black/tan, red, brown and chocolate. 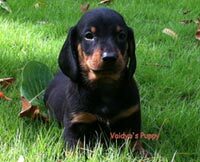 Raghu Offers Excellent Quality Dachshund Puppies, from High Pedigree Parentage. Most of them Show Prospect. Pet Quality Puppies also occasionally available. Click here to see Litter Box, Photographs and more details. Contact: Raghu: +91-96009-44725 (Pudukottai, Tamilnadu). Siddhesh Salunke Offers Top Quality Outstanding, Beautiful Show Promising Dachshund Puppies for show homes. Sire: Indian Champion Ventras Run a Riot Aka Rio. Dam: Indian Champion Sidlines Magic (Multiple Best In Show, Best Puppy In Show). Click Here to See Litter Box, Photographs of Puppies, Sire and Dam. 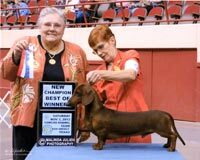 Windward kennels- Windward Kennels offers for sale an exciting litter of show quality wire haired dachshunds from the following combination: Sire- Ch.Windwards Varsha's Dynamic, Dam- Windwards Cleopatra. Serious enquiries to Preeti Narayanan- 0-98454-41251, Bangalore. E-mail: preeti@windwardkennels.com Click here to view litter box. 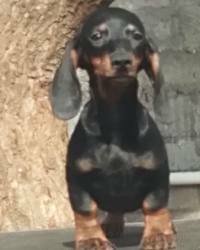 Dayspring Kennels: Show Quality Dachshunds Puppies Available For Sale. Pupies Born On: 03.08.2013; Sire: Am.Ch.Joy-Dens-By-The-Time-I-Get-To-Phoenix (Am.Imp.) (Phoenix); Dam: Daysprings Bethany's Waldi Glory; Click here to view litter box. For more details contact: Prasanna Manohar, Mobile: +91 97901 63633; Dr.Manohar, Mobile: +91 99444 70077. C.V.S.S. 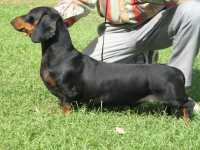 Satish - Exciting Show Quality Dachshund Litter from the following combination. Sire: Ch. Padpranpark's Grenadier, Dam: Padpranpark's Alonnah. 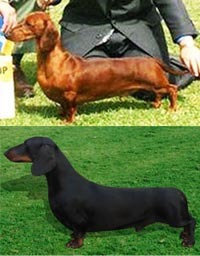 Both sire and dam awarded multiple BOB and Best Dachshund in show. Puppies for loving show homes. Click here to view Litter Box. Enquiries contact: C V S S Satish, Mob: +91 8978899903, Email: cvss.satish@gmail.com . Address: H No 5-9-263/17, Opp DYR Garden, Shaili Gardenia, Yapral, Secunderabad - 500087.